This FAQ will show you how to prevent your domain names from auto-renewal. The below instructions will show you how you can disable auto-renewal. 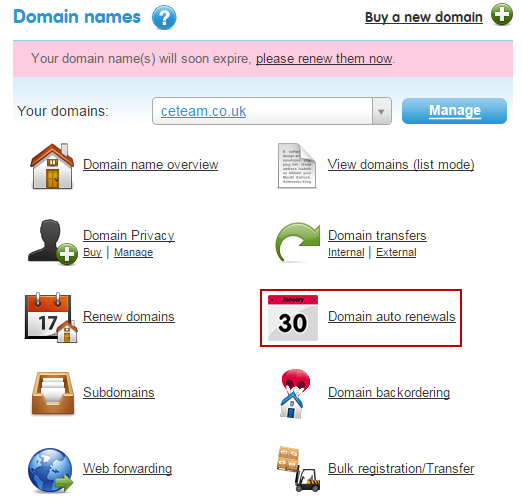 This can be reversed at any time before expiry, if you decide you would like to keep your domain names. Scroll down to the Domain names section, and click on the Domain auto renewals link. This will open your Domain renewal settings page, where you can choose the auto-renewal status of your Domain Names. 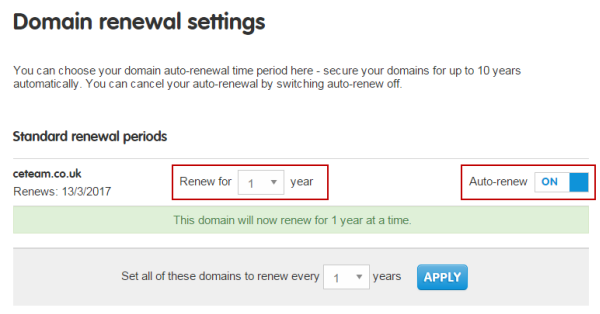 You can select the renewal period of your domain names using the dropdown box provided, and set your domains to renew for a period of up to 10 years. You can also set the renewal status for each domain name, so if you would like particular domain names to not renew, simply use the toggle to set the renewal status to Off. How do I surrender a .uk domain? You can request the deletion of a TLD by raising a support ticket using the CONTACT US link above. How do I set my domain name to Auto Renew? How do I renew my Domain names? What is the domain recovery period and how can I restore my domain names? What happens if I don’t renew my services on time?